Craftsman Professional 4 -Ton Jack Stands Just $22.99! Down From $55! 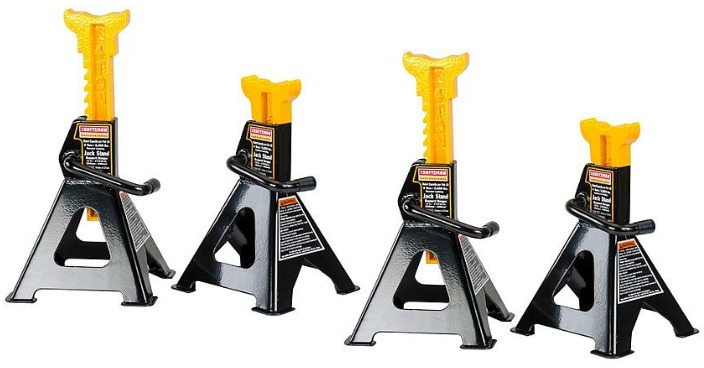 You are here: Home / Great Deals / Craftsman Professional 4 -Ton Jack Stands Just $22.99! Down From $55! Sears has this Craftsman C3 3/8-in. Drill/Driver Kit only sale for $22.99 (Reg. $55)! Featuring tough welded steel construction, thick load-bearing teeth and a wide stance, these Craftsman professional 4 ton jack stands deliver solid performance you can count on. A counterweighted pawl makes height adjustment fast, while locking in place to prevent dangerous slip, while a protective baked enamel coating helps prevent strength robbing corrosion for years.me.